May 1 - We're moving! The 9 month process of leasing a site in Lemon Creek is drawing to a close, and we couldn't be more excited. April 1-4 - We went to Biocycle West Coast in Portland, OR, to meet with composters and compost advocates around the country. We also got to tour an anerobic digestion facility and a large food scrap compost facility. Feb 15-17 - Join us in Sitka for the Southeast Alaska Farmer's Summit! I'll be giving a talk on Community Composting and will also be available to talk shop! Feb 12 - Listen to us talk on the radio about compost and our Path to Prosperity journey on both Juneau Afternoon and Capital Chat . Feb 1 - WE WON!....the Spruce Root Path to Prosperty business competition. The award will be officially presented at the Southeast Conference Mid-Session Summit on Feb 12. Nov 5 - Our lease proposal was unanimously approved by the Assembly! On the the Planning Commission next! Oct 28 - The Juneau Empire came for a site visit at our current location and reported on our proposed move. It made the cover of the Sunday paper! Read all about it here. Oct 26 - KTOO Public Media reported on our proposed expansion. Read all about it here . Oct 22 - Our centralized site lease proposal was approved by the Assembly Land Committee! Several more committees and votes to go before we know if the move/expansion can happen. Fall Ongoing - It's our annual leaf drive! 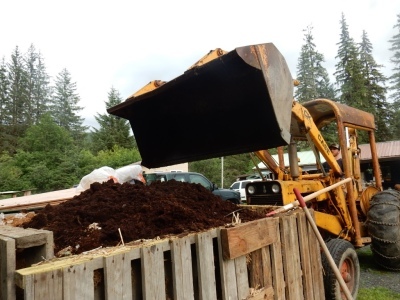 Rake your leaves and help us compost Juneau's food scraps. Drop your leaves off for FREE at the landfill 7-4:30 Mon-Sat. If you have a ton of leaves we can even pick them up! Sept 27-30 -I spent the weekend at Spruce Root's Path To Prosperity Boot Camp for small, local businesses. Catch our workshop 9:15-10, Growing a Compost Movement. August 24 - Finished Compost Delivery Day! April 21 - I'll be giving a talk on community composting in Haines as part of their Earth Day events. April 20 - The first (and very modest) bags of compost are being delivered! April 6- Come catch the latest compost scoop @ Kindred Post for First Friday. Fresh-brewed compost tea will be for sale. Feb 28 - Our 11-month collection/diversion numbers are 18,326 gallons and 40,629 pounds! Feb 16-18 - I'll be attending the Southeast Garden Conference in Haines. I'm looking forward to talks on soil, compost, heat collectors, and more! Jan 31 - Our 10-month collection/diversion numbers are 16,560 gallons and 36,520 pounds! ​Jan 19-26 - It's a beverage drive! Leave your coffee or tea donation out with your compost bucket and I'll deliver them to the Glory Hole's soup kitchen. (The full bean is in the Blog section) - DELIVERED on 1/29--THANK YOU! Jan 1 2018 - The numbers are in for 2017! In the past 9 months we collected 14,876 gallons of food scraps and yard debris, weighing in at 32,484 pounds. THANK YOU ALL for getting the Juneau compost ball rolling. D'you think we can double that number for 2018??? ON-GOING - Gift certificates are available! You can escape the guilt of consumerism and give the gift of composting service to friends. They can even compost the gift certificate! November 15 - I'll be talking compost in city chambers as part of the Sustainability Series sponsored by the Juneau Sustainability Commission. 5:30-7 pm. Bring your questions and ideas and come collaborate! ON-GOING - Help out by donating to our Leaf Drive! Oct 31 - A big thanks to KTOO reporter Jacob Resneck for including me in his story in the Talking Trash series! 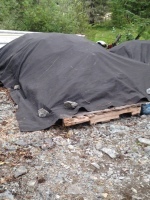 He drove around with me on the compost route this summer, and here's what he put together . Oct 16 -20 - I attended the Maine Compost School, where I got practical and hands-on training and also toured many composting facilities. September 23 - Support the Housing First project, drink some beer, eat some food, and use our sort stations at Capital Brewfest @ the JACC. August 31 - Our running diversion totals are now: 15,656 pounds of material collected and saved from the landfill! August 26 - Find our table at the JACC's Food Festival or attend the workshop on home composting. July 31 - Our running diversion totals are now: 11,973 pounds of material collected and 4,581 gallons of stuff saved from the landfill! June 30 - Our running diversion totals are now: 8,621 pounds of material collected and 3,287 gallons of stuff saved from the landfill! June 30 - We were highlighted in Corinne Conlon's article, Relearning Composting , in the Juneau Empire! May 31 - Our running diversion totals are now: 3,479 pounds of material collected and 1,527 gallons of stuff not in the landfill! May 20 - Hustled @ the UAS Community Day event. April 30 - Our first month of composting complete: 753 pounds of material collected and 312 gallons of stuff not in the landfill! April 23- Composted for the Glory Hole's Empty Bowls fundraiser. April 22- Hustled @ the Renewables Fair for Local Solutions. Networked and composted for an impromptu birthday bbq on the beach afterward! April 19 - Check out the radio spot on KTOO's A Juneau Afternoon. April 12 - Check out the article by Clara Miller in the Capital City Weekly. April 7 - The first buckets have been collected! March 31, 2017 - The first empty buckets have been delivered!